Are you a candidate for a heart attack? Recent studies show that cortisol levels are an indicator of 'burn out levels'. Burnout reduces cortisol levels below the normal range, meaning people do not react adequately to testing situations. Further, people feeling burnout are often diagnosed as depressed and given anti-depressants which further lower the cortisol level. A saliva test for cortisol gives a short term window, but the DetoxLab hair test provides a meaningful ninety day perspective on cortisol levels. Stress is caused by a variety of external factors and is also self generated. The symptoms are varied and include a variety of cognitive, emotional, physical and behavioral symptoms. Research studies show that everyday stress reshapes the brain-nerve cells change their morphology. The number of connections with other cells and the way they communicate with other neurons is affected. In most cases, these responses are adaptive and beneficial-they help the brain cope with stress and shape adequate behavioral reaction. However, upon severe stress things can get out of control, the brain buffering capacity is exhausted and the nerve cells in the hippocampus – an area of the brain responsible for learning and memory – start to withdraw their processes, don’t effectively communicate with other cells and show signs of disease. Chronic repetitive stress has a more powerful effect on the brain during adolescence than in adulthood. Research indicates that stress in adolescence causes a molecular loss of glutamate receptors. a key factor in mental illness. A loss of glutamate receptors in the prefrontal cortex, the area of the brain that controls memory, and decision making can lead to later significant cognitive impairment. While there have been many behavioral studies about stress, understanding stress at the molecular level creates new treatment possibilities. Now, the quantitative measurement of stress is possible. Years of research at leading institutions in the U.S., Canada and other countries have determined that the quantitative analysis of cortisol deposited over a 90 to 100 day period in the cortex of the hair shaft, is an extremely accurate, quantitative reflection of chronic stress levels during that period. Perhaps the most significant role of quantitative stress level determination will be, as a starting point, in an individuals understanding of what their chronic stress level is. This is an important guide to any subsequent treatment. Cortisol levels in tested individuals range between about 100 ng/g and 1000ng/g and when the analysis is completed, the report and conclusions are documented. 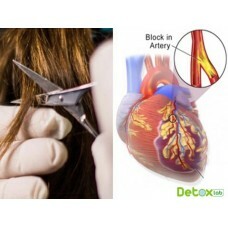 While heart attacks are caused by a variety of factors including stress, lifestyle, genetics, physiology, etc., a study released in September 2010 shows the very important correlation between the risk of a heart attack and the stress levels as reflected in the level of cortisol deposited and stored in a person’s hair. The cortex of the hair shaft usually holds up to six months of deposited cortisol, providing a measurable record of stress levels. Stress levels have been identified as a significant indicator of the potential for heart attacks. The study was published in the International Journal on the Biology of Stress. The research was carried out at leading universities and institutes in the U.S.A.,Canada and internationally and those studies have confirmed the direct relationship between cortisol levels and predisposition to a heart attack. The studies were widely publicized in the media because of their importance. Extensive studies carried out at many research institutions over an extended period of time have indicated that cortisol levels in hair are a valid predictor of potentially acute myocardial infarction. The analysis of your hair sample will determine the cortisol level and indicate the relative risk based on this level. What does your stress level as measured by the Cortisol hair analysis mean? In addition to its relation to heart attack vulnerability, chronic stress is a catalyst which accelerates the spread of a wide variety of disease conditions including cancer. Research indicates that stress biologically reprogrammed certain body defense mechanisms, diminishing their protective ability. A 2010 study published in the Journal Cancer Research indicates that high chronic stress levels cause cancer cells to migrate from a primary tumor and attack various organs. Stress does not directly cause disease, but is a facilitator of disease conditions. Knowing your chronic stress level is an important guide which clinicians may use to recommend changes in lifestyle and medication. Elevated levels of cortisol provide an important, early warning sign of a potentially acute event. If levels are found to be elevated, the prudent course would be consultation with your physician. The analysis of your hair cortisol levels will clearly indicate the relative level of risk, but it is important to remember that stress level, as reflected by cortisol, is one of a multiplex of factors that relate to heart attacks, but apparently one with great significance. The DetoxLab sample hair collection kit will allow you to collect a 1.5” or 2” (or longer) sample of scalp hair and submit it to our laboratory for analysis of your 90-day cumulative cortisol level as it relates to stress and our recommendations.